RCTC services are designed to get you there and back… smarter, faster, safer. Don’t let traffic rule your life. 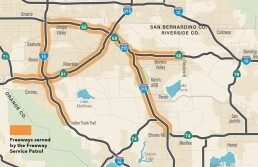 Choose the 91 Express Lanes to travel between Riverside and Orange Counties and live life on time. Discover your best commute to work and enjoy the ride. Whether it’s a car/vanpool match, taking Metrolink, or riding the bus, IE Commuter helps you find a rideshare option that fits your route and schedule. Plus, on top of saving gas and the environment, you may be eligible for rideshare incentives too! Park & Ride and Employer Rideshare Program info is also available. Climb aboard the bus or train to get to work or leisure destinations. Ride Metrolink or use one of the many bus transit services in Riverside County as an alternative to driving. Avoid congested routes and areas of construction or check for snow chain advisories with helpful real-time traffic information from IE511.org. You can also outsmart traffic by calling 511 from your phone for up-to-the minute travel information and advisories. RCTC hopes your trip is as smooth as possible, but when there is a problem, we’re here to help. If your vehicle breaks down on the busiest sections of the 91, 60, 215, and 15 freeways, the Freeway Service Patrol will come to your rescue. And our network of Call Boxes provide a direct link to help when your cell phone can’t help you. The rush hour commute can be a challenge, even when there aren’t any accidents or closures. A stalled car by the side of the road can snarl traffic for hours. When it’s you in that stalled car, your commute can turn into a nightmare. Specially marked Freeway Service Patrol tow trucks patrol the entirety of Riverside County’s State Route 91, Interstate 15 from State Route 60 south to Indian Truck Trail Road, State Route 60 from Milliken Avenue to Theodore Street, and Interstate 215 from the San Bernardino County line south to the State Route 74/4th Street Interchange. Freeway Service Patrol drivers will “jump start” your car if your battery is dead, refill your radiator and tape hoses, change a flat tire, or provide a gallon of gas if you run out. If they can’t get your car going, they will tow it off the freeway free of charge to a location approved by the California Highway Patrol (CHP). The Freeway Service Patrol cannot tow you to a private repair facility or recommend other tow services or repair shops. The Freeway Service Patrol operates weekdays except holidays, from 5:30 am to 8:30 am and 2:30 pm to 6:30 pm Monday through Friday. Friday afternoon service begins early and runs 12:30 pm to 6:30 pm. 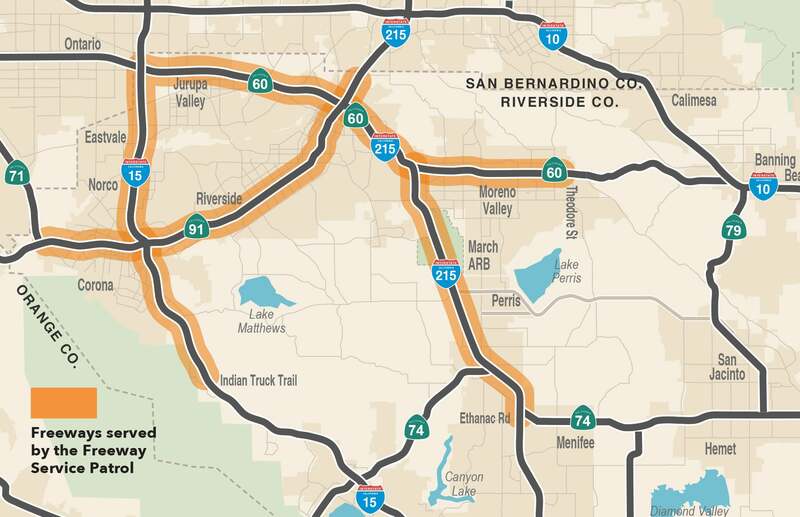 The Freeway Service Patrol is funded by the State of California (Caltrans) and administered by the Riverside County Transportation Commission (RCTC) in its role as the Service Authority for Freeway Emergencies (SAFE). The CHP provides oversight for the program. Special weekend FSP service provided on select highway segments is sponsored by the Mobile Source Air Pollution Reduction Review Committee (MSRC). All tow trucks are white and display the Freeway Service Patrol logo during service hours. The drivers wear blue uniforms and yellow safety vests with the same logo. All Freeway Service Patrol drivers wear an identification badge on their shirts and are certified by the CHP. If you drive along any of Riverside County’s interstate freeways or state highways, you will see solar-powered Call Boxes throughout your trip. More than 300 centerline miles of roadway are equipped with yellow Call Boxes that can summon assistance should you have a freeway emergency. All you need to do is open the door of the Call Box, lift the receiver and press the large red button inside. The Call Box will connect you with an operator that will summon help for you as quickly as possible. Stay on the line, even if your call is not immediately answered. There is no need to hang up and try again. You will not have long to wait. Call Boxes in Riverside County are funded through a $1 fee imposed on annual vehicle registrations. Safety comes first. Never cross the freeway to reach a Call Box. Be sure your car is as far as possible on the shoulder. Exit the vehicle on the passenger side. Always look for a Call Box you can reach without crossing an on-ramp or off-ramp.